Most of you have probably heard about the commotion over the final episode of the first season of the hit show Game of Thrones. It started when a Reddit user announced that, on the commentary track for the episode, producers David Benioff and D.B. Weiss mention how one of the prop heads on a pike is none other than former president George W. Bush. They quickly apologized for having done it, as did HBO, but the network didn’t stop there. /Film is now reporting that they’ve pulled the episode from their HBO Go service and iTunes, in addition to halting shipments of the season on DVD and Blu-Ray. 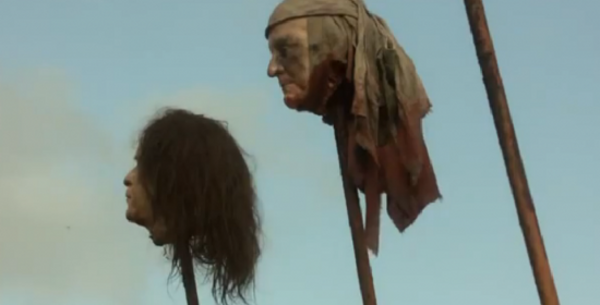 Weiss’s and Benioff’s official excuse is that they needed a prop head and that one happened to be lying around. This is quite possible, though it doesn’t explain why it was lying around in the first place. It doesn’t really seem like there was any political statement behind it, especially given that it’s rather hard to tell that it’s Bush. If they were trying to make some kind of statement, you would think they would make it a bit more noticeable. I’ve watched all of season one twice and it’s not something that I noticed, but judge for yourself. Take a look at the head on the left in the picture above. Would you have known that that was Bush had they not said anything? Nobody noticed it before, but now that they let the cat out of the bag, the story blew up rather quickly. Personally, it seems like this story has been a bit overblown, because, again, it doesn’t really seem like they were trying to make any kind of statement. It’s more likely that they were just having an in-joke amongst themselves. Unfortunately, they decided to mention it in the commentary, which led to a bit of an overreaction from HBO. If these guys did anything like this for season two, hopefully they’ll at least keep it to themselves when it comes time to do the commentary (if they haven’t already) so that they can avoid such backlash in the future. Now we want to hear what you think. Was it insensitive? Is HBO overreacting? Let us know in the comments!